Hey guys. I know, I'm posting a ton this week! So as an author, I want to get my name and novels to the public as much as possible. I've been talking with some friends and people who have helped me before when my first novel came out in August about what to giveaway and what readers want price wise and how to go about all this fun stuff. ...just to get started. I like bookmarks and although I don't read from paperbacks much anymore, I've kind of started collecting them. So I gave a few away at bookstores around CT that carry my novel and I've used them in giveaways and gotten really good responses. Just today I posted on facebook since I have so many, I want get rid of them and hand them out and if people want them, they should get some! And I got a really good response. 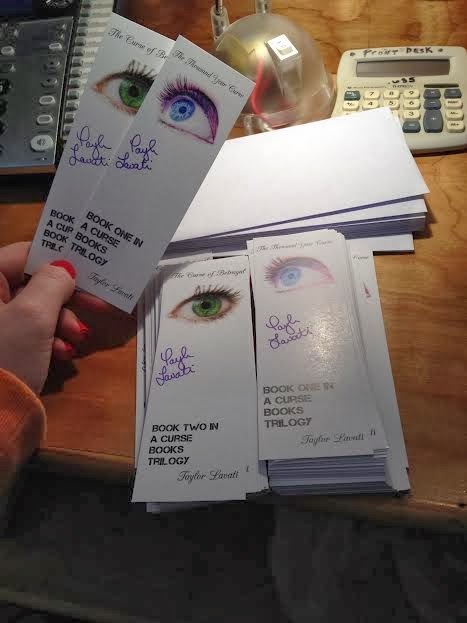 But do people really want bookmarks or is just the appeal of something free? I mean, I'm a college student so I'm broke enough as it is but I want people to be engaged and follow me and like my things. Plus with all these new ebook prices, I want to know really what you people pay. I feel like free books really aren't the answer. TTYC is 2.99 and I think that's probably the average for ebooks lately. I know typically when I buy an ebook, I'll pay around 2.99 and 3.99 but never really more. If it's less I feel like it's not worth it or something's fishy. Anyway, here's a survey and I would LOVE if you'd just stop by reallllllly fast, I promise, it's super fast and pain free. Fill it out, there's no mandatory questions or anything like that. Nothing hard. It's not finals around here. Help me out!! Plus, I have bookmarks!! :) So if you do my survey or honestly, if you just want one, or both, shoot me an email with your address, no questions asked. Thanks for all your support and feedback through all my rambling. You're helping a sissta out big time!